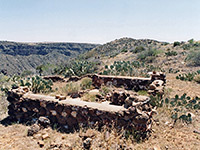 There are several lightly-used trails in Agua Fria National Monument to backcountry archaeological sites, of which one is sufficiently well known to have a BLM register at the trailhead (Pueblo la Plata), but the only major hiking path in the monument is the 0.8 mile route along Badger Springs Canyon, a west-side tributary of the Agua Fria River. 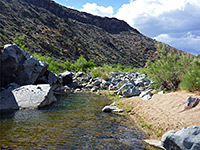 From the start point at the end of a short track near Interstate 17, the path follows the wash downstream, past springs that sustain a narrow, riparian corridor of trees, bushes and wildflowers, to a deep pool along the river. 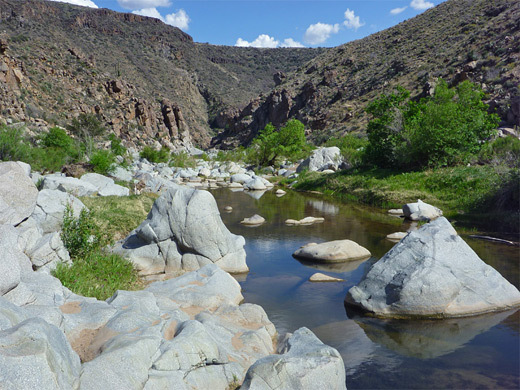 Most visitors go no further, but the Agua Fria can be quite easily explored upstream or downstream; the latter direction is more scenic as the canyon deepens, the steeply sloping walls rising up to 900 feet high, as the river flows through a long succession of pools and cascades, bordered by smooth, water-polished, white boulders. The rocky canyon sides are home to many large cacti including plenty of saguaro. One option for a loop hike, of 7 miles, is to walk downstream to just beyond the next major tributary (Perry Tank Canyon), climb the western side of the canyon to the site of an old gold/silver mine on the rim, then return via a mostly level walk over the plateau of Black Mesa. The vegetation on the rim is generally sparse and well separated so cross country hiking is quite straightforward. Agua Fria overview map, Badger Springs Canyon topo map. 16 views of Badger Springs Canyon and the Agua Fria River. 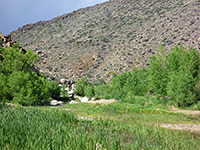 The trailhead is at the end of a 0.8 mile track on the east side of I-17, starting from the Badger Springs exit (256). The initial section is gravel, as far as a BLM noticeboard about the national monument, then the remainder is earth, along a stream bed for a while and crossing other small drainages, but still generally fine for most vehicles. If conditions are wet, it takes less than 20 minutes to walk from the gravel section. Several side tracks branch off, leading to other parking or camping areas, and one route continues north to link with Bloody Basin Road, the main route into the national monument backcountry. At the end of the track, a path descends slightly into the Badger Springs streambed, just as it enters a wide, relatively shallow canyon, bordered by sloping sides several hundred feet high. The remainder of the way to the Agua Fria River is along the sandy wash bed or on well-defined paths to one side. The initial section of the wash is usually dry for most of the year, but even in midsummer pools are formed around a spring, located about half way to the river; near here are found the greatest concentration of wildflowers - some of the many species are climbing milkweed, Oak Creek ragwort, spiny goldenbush and trailing four o'clock. The ravine continues to slope gently down, and reaches the river at the edge of a big pool at least 500 feet long, with boulders and small cliffs along the near edge, and a band of trees on the far side. The pool is a popular swimming/paddling location. The upstream section of the river canyon is wider, filled with many boulders, while the downstream part is generally narrower, and the canyon more V-shaped. There is no trail as such downstream but it is easy enough to walk beside or occasionally in the river; many boulders provide crossing places if required. Saguaro soon appear, then many other types of cacti - big opuntia, California barrel cacti, clumps of echinocereus and mammillaria, all growing in crevices in the walls of the increasingly rocky canyon. At river level there are trees and grassy patches but the surroundings are mostly open, with sand bars and grey granite boulders, polished smooth by the waters. Rows of driftwood many feet above the normal water level tell of the great force of the occasional floods down the canyon, in contrast to the usual peaceful, quiet scene. In some places the river flows through rocky channels, forming deeper pools, but there are no extended narrow sections. In the middle of the canyon, shortly after a large tributary ravine (Perry Tank Canyon) joins from the east, parts of an old rusty pipe can be seen alongside the river; the pipe was once used to provide water for Richinbar Mine, situated 700 feet above on the western rim. This location is 2.3 miles downstream of Badger Springs Canyon, and is a possible turn around point; otherwise, if following the canyon all the way (another 8 miles to the north end of a road from Black Canyon City), a car shuttle would be required. An alternative to retracing steps back up the canyon is to ascend the western side of the canyon - it takes about 20 minutes of scrambling and climbing to reach the rim, on which are various crumbling remnants of buildings and equipment. Richinbar Mine produced gold and silver from about 1896 to 1912, and was part of a sizeable settlement that even contained a registered post office. From here, the Badger Springs trailhead is about one hour's walk away northwards, mostly over a flat, stony plateau, then down a gentle slope towards the interstate.